Even with a loss today, the Cardinals managed to slip into the post-season. With Washington’s loss in the first game of their double-header today, the Cardinals officially clinched a post-season spot. Although the Cardinals lost tonight 6-4, they still remain two games ahead of both Pittsburgh and Cincinnati. After splitting the four-game series in Colorado, the Cardinals managed to take the first two games in Milwaukee before playing some sloppy defense this evening. One of the offensive heroes the previous two nights, first baseman Matt Adams went 0 for 5 with three strikeouts, including in the top of the ninth with the tying run on first base. Still, it’s been hard to argue with Matt’s production the last couple of weeks. Filling in for an injured Allen Craig (who likely won’t be available until after the post-season starts), Matt’s turned it on. Not counting tonight’s game, he’s managed to slash .344/.375/.705 with seven home runs and 14 RBI since September 2. Not to be outdone, Matt Carpenter’s also been on a tear after going through a rough stretch the last part of June and the first half of August. Since September 8, he’s slashed .407/.493/576. His double yesterday also gave him the Cardinals’ record for most doubles in a season by a left-hander (Joe Medwick holds the franchise record with 64 in 1936, a year before he won the NL’s last Triple Crown). With all due respect to Adams and Carpenter, though, the MVP of the last week had to be Matt Holliday. I don’t think there’s been a hotter hitter the last seven games: .516/.583/.710 with a home run and 9 RBI. Holliday’s now hit 20 or more home runs for eight consecutive seasons, and with his hot streak has brought his season line up to .298/.382/.479, getting him closer to his career average of .311/.386/.530. 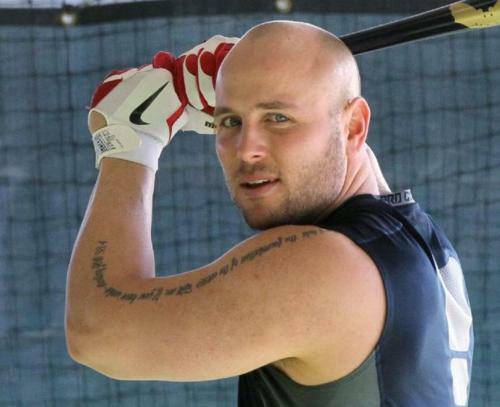 With Craig out and both Yadier Molina and Carlos Beltran struggling at the plate in September, Holliday’s by far the most dangerous middle-of-the-order hitter and the team’s gonna lean on him. On the other side of the mound, the starting pitching has done well to right itself. Adam Wainwright’s posted three straight quality starts and a 1.59 ERA in those three games. Lance Lynn, who was nearly demoted to the bullpen, has similarly thrown three excellent starts in a row, allowing just three earned runs in 18.1 innings. Shelby Miller wasn’t sharp against Milwaukee Friday but still has 2.55 ERA in his last three games. The real question, as everyone’s aware of, is what to do with Edward Mujica. By and large, Mujica’s been outstanding this season, earning his first All-Star appearance in the stead of Adam Wainwright. Since that one stretch in which he threw six innings in the span of three games, though, he’s been much less sharp, with an ERA of 6.97 in 12 games. Even worse, hitters have slashed .422/.458/.756 against him. Mujica first reported issues with his shoulder after the team shut him down the first time, and now he’s indicated that fatigue may be an issue more recently. He’s nowhere near his career high (he threw 93.2 in 2009 when he was with San Diego), so it’s not as though he’s been pressed beyond any innings limit. The fact that he’s indicating a problem with his shoulder, though, could be a sign that perhaps his mechanics are off. Should Mike Matheny decided to pull him from the closer’s spot, then there are a few in-house options. Trevor Rosenthal has emerged with a nasty arsenal. His fastball’s averaged 96.4 this year according to PITCHf/x, and he’s struck out 12.82 batters every nine innings. Kevin Siegrist, who’s been touted by many as the closer of the future, has just been flat out filthy. His ERA stands at a ridiculous 0.48, and he’s also struck out more than 12 batters every nine innings. His fastball averages around 95 MPH, and his changeup has been pretty effective. Add that to the fact that he’s a lefty, and he could be an absolute killer as a closer. Lefties have hit just .115 against him, while righties have barely fared better: .127/.225/.238. Still, if I were a betting man (meaning don’t bet on what I say, as I’m normally wrong in these situations), I’d put my money on John Axford getting the nod should Matheny switch out closers. Axford was one of the top closers in baseball in 2011 (NL-leading 46 saves to go with a 1.95 ERA), and he’s closed out games in the post-season before (1.29 ERA, 3 saves in six games, nine strikeouts in seven innings). Matheny’s got a week to get it sorted out before it could get really ugly.